You can tell by the birthday cards on the racks in the stores: lots more for older people, not as many for the little ones. The massive Baby Boom cohort (born between 1946 and 1964, with 1957 the peak year of births) keeps on truckin’. Every day, 10,000 people turn 65. Already, as of 2010, 40.3 million people were 65 or older. By 2030, 72 million people will be 65 or older. And they will keep getting older, for decades. Are we ready? We hope to be, but we need help. The numbers alone are almost too big to grasp, because it isn’t just about the older individuals — it’s about everyone in their lives, too. Already, as of 2009, some 43.5 million adults were providing unpaid care to an adult family member or friend age 50 or older. The caregivers themselves are no babies, with a group average age of 50. More than three-quarters (77%) of those caregivers said they need more help or information about at least one aspect of care. More than a third (38%) said they need more information about keeping the person they care for safe at home – which is where 90% of people older than 65 say they want to be. Can it be done? There really isn’t any choice. Among all age groups, home ownership rates are highest for older adults. Despite all the images of posh retirement living and talk about nursing homes, 90% of people age 70 and older live in conventional housing. They’re not all frail. In fact, more than half of people 85 and older are quite able to carry out basic functions. Still, look at what’s coming. More than one third of households headed by people age 55 to 64 report difficulties with at least one physical activity. The boomers are living with more health problems than we hoped and they’re carrying those problems, many of them chronic, forward into their older years. Yet it is estimated that less than 10% of the nation’s housing units are fully accessible. If we want staying power, we as individuals and a population need to get strong, stay strong and make our housing strong enough to meet our needs. We need education, community support, ingenuity, enlightened public policy, financial resources, patience, understanding, a good sense of humor and some grab bars. 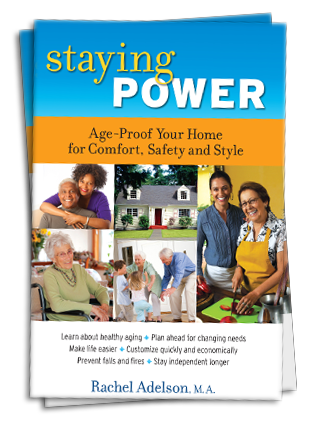 Knowledge is power: The education part can start by reading Staying Power: Age-Proof Your Home for Comfort, Safety and Style.